This week captain, Joel Selwood, breaks the long-standing record of most games as captain of the club, set by Reg Hickey 78 years ago. Hickey's record of 142 games as captain was set between 1930 and 1940. Drafted back in 2006, with the seventh pick overall, Selwood played 21 games in his first season before going on to win the Rising Star award by seven votes over Collingwood’s Scott Pendlebury, add a Premiership medallion and was also awarded the best first year player at the Best and Fairest. Selwood played his 50th game in Round 5 2009, collecting 31 disposals in the 93-point win over Brisbane at Skilled Stadium. He added his first All Australian selection to his collection and was voted the Most Courageous player by his peers. 2013 was arguably Selwood’s most successful year as a player, playing all 25 games on his way to his second Best and Fairest, Captained the All Australian team, was voted the Most Courageous player and Best Captain by his peers, and was runner up in the 2013 Brownlow Medal with 27 votes, one behind winner Gary Ablett. Since 2013, Selwood has added three further All Australians and one Best and Fairest to his trophy cabinet. Joel was elevated to Vice-Captain in 2011, before going on to become the permanent Captain in 2012 after the retirement of Cameron Ling. Since then, Selwood has led Geelong to five finals series, which has led to three Preliminary Final appearances. In his 142 games as captain, he has won 95 of them at a win rate of 67%. Reg Hickey was an imposing figure for Geelong. Hickey played 245 games in a career spanning 15 seasons from 1926 to 1940. Hickey was captain from 1932 to 1935 and 1937 to 1940. Hickey was also coach during his second stint as Captain and coached for another 10 years between 1949 and 1959, leading Geelong to two more Premierships in 1951 and 1952. Reg is a two-time Premiership player for the club, playing in the 1931 Grand Final and was captain/coach in the 1937 triumph. Hickey also won two Best and Fairests for the club (1928 and 1934) and was runner up in the 1936 Brownlow Medal. Hickey was not only tough, both as captain and coach, but he was innovative. Prior to the 1937 Grand Final, Hickey had his players go through one final training session. This session lasted for over an hour and he got the players to focus on the basics of the game. He broke this session down into each skill. The session began with some kicking practice. Players then got broken off into small groups and practiced picking up the rolling ball. Handballing followed, then ball movement from the back half to the front half. At quarter time of the 1937 Grand Final, Geelong were trailing by three goals. Hickey pulled changes like no one had seen before. Ruckman Jack Evans was switched to full forward, Les Hardiman was switched from full forward to centre half back, Joe Sellwood from centre half back to centre half forward and Gordon Abbott to centre half forward to ruck. These proved to be match winning changes. 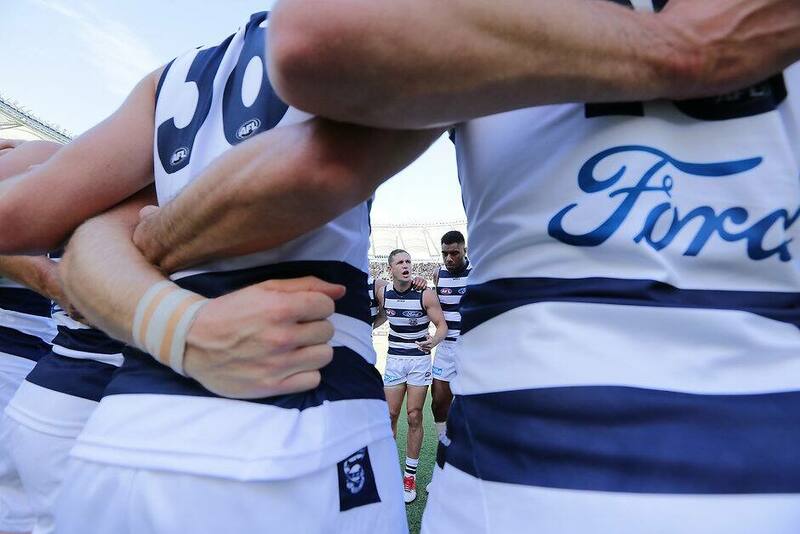 Geelong kicked five goals to two in the second quarter and six goals to one in the last quarter to win by 32 points. Jack Evans finished with six goals and Les Hardiman shut down the dangerous Ron Todd. There are many stories about the great Reg Hickey, but there is one that stands out above all others, as told by 1952 Premiership Player Geoff Williams. Joel embodies what Geelong is. Tough, uncompromising but fair. On the field, Joel puts his body on the line like there is no tomorrow, but off the field, he is involved heavily in the community, namely being an ambassador for Run Geelong. Reg was very similar, a brute of a leader on the field, but a people person off the field. It is fitting that someone of Selwood’s stature is the one to equal the record that Reg Hickey set 78 years ago. It is also fitting that Joel Selwood will break the record when he leads out his mighty Cats onto the hallowed turf of Kardinia Park in round four. A ground where both his name and Hickey’s name will go down in history as two of the greatest leaders this club has ever seen.